The forecast shows that technological change may accelerate known employment trends, such as the shift to services, and may also increase polarisation in job growth, with fast growth projected for high-skill occupations and moderate growth for certain lower-skill jobs. Employment levels in medium-skill occupations will experience a hollowing out, with occupations such as skilled manual workers and clerks, likely to decline or stay the same, as automation and offshoring take their toll. In that context, a rethink of traditional vocational education and training is needed. Manufacturing is the main sector affected by both global trade and automation, with economic growth projected to show no creation of new jobs and even job losses. However, some high-value-added sectors, including electrical equipment, other machinery, and equipment manufacturing and motor vehicles, are expected to see substantial employment growth. Employment is also forecast to increase in computer, optical and electronic equipment. Service sectors will experience the fastest employment growth, notably legal and accounting services, research and development, advertising and market research, along with administrative and support service activities. 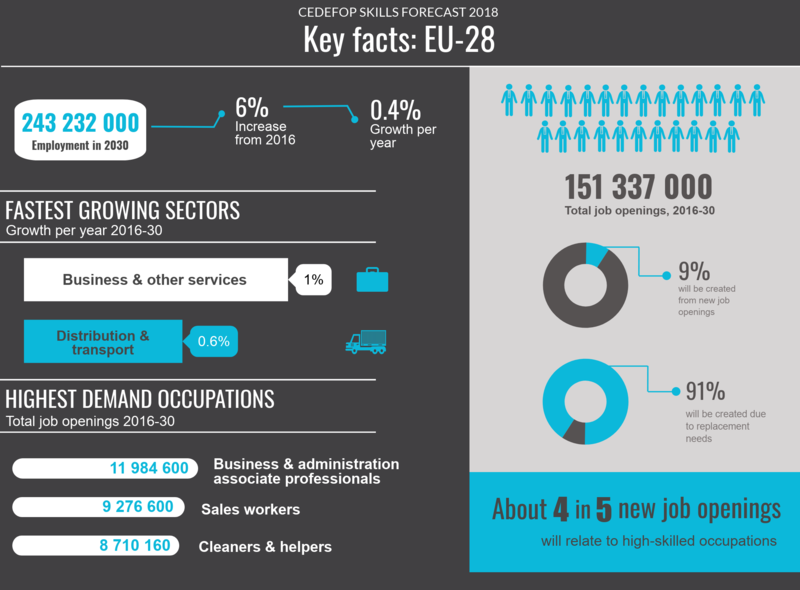 Cedefop’s latest briefing note takes a detailed look at the skills forecast. Check out the forecast for the EU-28 and results by country on the Cedefop website. A video animation presents the main forecast results in 2 minutes.